Although Ginger Spice is, by a whole generation, a reference to a member of the Spice Girls, it was also one of the most valuable trading commodities of the Elizabethan world. It is mentioned in the Koran and in the writings of Confucius as having ‘special qualities’ for health and happiness. When ginger first reached Europe, it was found to have a vast range of benefits from treating dandruff to having aphrodisiac qualities. Imported from China as early as the 9th century by the Romans, it remained largely used only in the Mediterranean area until the late Middle-Ages. The health benefits of ginger and the spices available in Asia and the East Indies drove European exploration in the 15th century. The Spanish, Portuguese, Dutch and the English competed to gain control of the spice trade. Its helpfulness as an aphrodisiac got it a mention in the Karma Sutra. On certain South Sea Islands ginger root as part of a woman’s dowry is a blessing for many children. It was used in the great dining halls of Elizabethan England prior to the use of pepper to flavour foods. The Mariners who brought it to Europe realized its use in relieving seasickness and in aiding digestion. 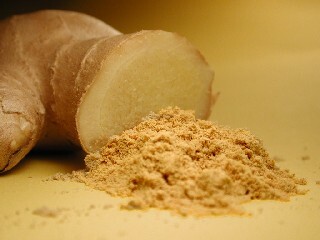 Historically ginger was used to treat tropical diseases such as Yellow Fever and Malaria. It has long been known to have an anti-inflammatory effect and relieves joint pains associated with Arthritis. Its continued use in South East Asian cuisine and its rediscovery as a natural health remedy will ensure today’s generations benefit from the real Ginger spice. A few uses you might recognise. As a kid I made my own ginger beer and who hasn’t had ginger sprinkled on Baked Apples. You haven’t? I recommend it.